Successfully Added SkyPix Cordless Handheld Scanner to your Shopping Cart. 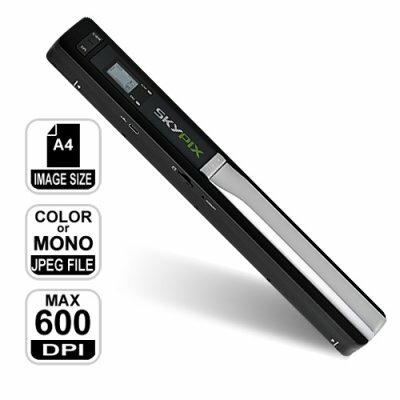 Instantly digitize all those newspaper snippets, business cards, and receipts with the SkyPix Cordless Handheld Scanner! Capable of capturing full color 600 DPI resolution images onto a microSD memory card, this handheld scanner helps preserve important files, receipts, and any other documents you need saved. The SkyPix Cordless Handheld Scanner makes it easy to instantly scan and digitize anything. Just move the scanner over an area and its sensitive color image sensor scans at high (600 DPI) or standard (300 DPI) resolution, saving images onto a microSD card for easy retrieval. Photos, business cards, books, newspapers, magazines, receipts, notes - the SkyPix Cordless Handheld Scanner is great for everything! So what are some great benefits of the SkyPix Cordless Handheld Scanner? Organization: With the SkyPix Cordless Handheld Scanner, everything is digitized. No more worrying about getting documents dirty or damaged, no more worrying about misplacing or losing papers, everything you scan is digitized and saved onto a micro SD card for future use! Convenience: Tired of heading to the local Kinko's just so you can make a scan of a single document? With the SkyPix Cordless Handheld Scanner, it's only a matter of seconds! Also, mom might need one this Christmas to scan all those recipes she chances across from time to time. Price: It doesn't matter if you scan 5 pages a day, or 1 page every 5 days, the SkyPix Cordless Handheld Scanner will save you money - it's as simple as that. Imagine it costs you $30 to scan a whole book... With our factory-direct price, all you have to do is scan a few more and this scanner will have easily paid for itself! For easy, convenient scanning of any document at any time, the SkyPix Cordless Handheld Scanner is here. Available in our warehouse now, order today and we'll express ship it out tomorrow! Brought to you by the leader in wholesale electronics, Chinavasion. on 2010-11-16 16:17:28 Very convenient in use! I have bought one scanner for promotion among my customers. They find it very good! But I have been scanning with the item only! Because of the product solves many problems at home, at work or if you are a student who often visit libraries. I was an university student of philological department since 1996 till 2002 so if I have had such a device, I would spend much less time among the dusty books! on 2010-11-16 01:15:02 The really spy gadget!!! I have bought for demonstration the gadget. When I promote it , I say that the scanner is a spy gadget! Why?- they ask me. Because you can come to your boss when he or she is out, put a SD card in the scanner and swifter than you could use a stationary one You would nap all the info on the company documents!